Best way to upload GoPro 4K/1080p videos to YouTube and free download GoPro 4K/1080p videos from YouTube. Q: I recently bought GoPro Hero6 Black and capture some amazing videos, but I can't upload these GoPro videos to YouTube. Is there a solution or a fast way to allow me to upload and share GoPro videos to YouTube? GoPro's high-end cameras and drones are known to record stunning 4K/1080p or 360 degree VR videos. Cyclists, adventure and extreme sports enthusiasts often use GoPro cameras/drones to capture professional-quality smooth action videos and movies. How to upload recorded GoPro videos to social media like YouTube to show your marvelous video to the world? This post provides a detailed guide. Besides, you'll also learn the simplest solution to free download GoPro videos or any other videos/movies from YouTube in this tutorial. - Convert (GoPro camcorders/drones) videos to YouTube compatible video formats. Convert MKV, HEVC, AVCHD, M2TS, MOD, etc. to MP4, FLV, etc. with best quality. - Compress (GoPro) 4K video to 1080p with best output. Freely adjust video parameters like resolution, frame rate, bit rate, aspect ratio. - Allow users to free download 4K/1080p/VR GoPro videos or any other videos, movies, MP3 songs from YouTube, Dailymotion, Vimeo and 300+ sites. WinX HD Video Converter Deluxe is a perfect combination of video converter, editor, compressor & downloader tool. YouTube supported video formats: MOV, MPEG4, MP4, AVI, WMV, MPEG-PS, FLV, 3GPP, WebM. Top recommended video format and codec is MP4 (H.264). YouTube video upload length: Normally YouTube has a 15-minute limit. 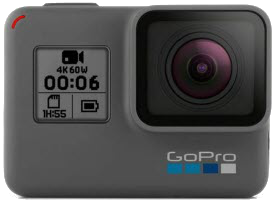 If you'd like to upload GoPro video footages to YouTube, you need to trim a 15 minutes section or divide GoPro 4K/HD videos into shorter 15 minutes videos to upload one by one. YouTube video upload file size: 2GB. If you use an up-to-date browser, you can upload 20GB. Supported video frame rate: YouTube supports up to 60 frames per second. Accepted video resolutions: 2160p (4K): 3840 x 2160, 1440p (2K): 2560x1440, 1080p: 1920x1080, 720p: 1280x720, 480p: 854x480, etc. 1080p and 720p are the most commonly used video resolution. If you sometimes meet the problem of GoPro videos won't upload to YouTube, it may because the GoPro video format isn't compatible to YouTube or the GoPro video is very large and you didn't trim it to an appropriate period. To download/upload GoPro videos to YouTube, WinX HD Video Converter Deluxe is a professional helper. It is an all-in-one video converter, video compressor, video editor, video downloader (this function is totally free). This stellar video converter for Windows (10) can convert any GoPro 4K/HD video to YouTube compatible format and adjust the video audio parameters to fit for YouTube video uploading requirements. You can use it to compress 4K to 1080p, 720p, etc. with great quality, and trim any favorite part of the recorded GoPro video to upload to YouTube later. One big merit of this video converter is that it also supports free downloading (GoPro) videos, any other 8K/4K/HD 1080p/720p videos/movies, 2019 new songs MP3, etc. from YouTube, Dailymotion, Vimeo, Vevo and 300+ sites. Warm tip: This top GoPro video converter fully supports Intel QSV, Nvidia CUDA/NVENC, AMD hardware acceleration to provide ultrafast 4K/HD video processing speed. Free download, install WinX HD Video Converter Deluxe on Windows 10/8/7 or Mac, and follow the guide below to compress/convert GoPro videos to upload/share onto YouTube, as well as free download any favorite GoPro 4K/1080p/VR videos from YouTube at superfast speed. Launch the GoPro video converter & editor and click "Video" button on the main interface, then click "+Video" button on the tool bar to select and load original GoPro camera/drone video. HEVC (H.265) GoPro video is also supported and this software can quickly convert HEVC to H.264. 1. Choose an output format which is supported by YouTube like MP4 from the Target Format column. 2. Click "Trim" icon to directly drag the two green knobs to get a specific video clip or click the orange "Cut" icon to set a Start Time and End Time to trim the preferred part of the GoPro video. 3. Click "Codec Option" icon to freely adjust video/audio parameters like resolution, frame rate, bit rate, etc. to fit for YouTube video uploading requirements. This video converter can also compress GoPro 4K video to 1080p with best output quality. Click "Browse" to set a computer folder to store the converted GoPro video. Hit "RUN" to start converting/compressing GoPro video to upload to YouTube later. Run WinX HD Video Converter Deluxe and click "Downloader" -> "Add Video" button to open the video downloading window. Go to YouTube to find the GoPro video you'd like to free download. Open and play the video. Copy and paste the URL of the GoPro video on YouTube to the address bar. Then click "Analyze". Choose a preferred video format/resolution like 4K MP4, 1080p MP4, 720p MP4, etc. Then click "OK". Hit "Download Now" to start free downloading GoPro 4K/1080p/720p HD videos from YouTube at ultrafast speed. Best all-in-one GoPro video editing software, video converter and downloader allows users to edit GoPro video/footage, and convert video to MP4, AVI, WMV, FLV, MOV, iPhone, iPad, Android and many more. Also help users to free download any 8K/4K/HD/SD or VR videos/movies from YouTube, Dailymotion, Facebook and 300+ video sites. GoPro: GoPro official website - capture and share your world. Use GoPro camera to live the moment, capture the moment, share the moment. GoPro YouTube Channel: We make the World's Most Versatile Camera. Join us for new videos every week!